From a young age, Aan’s director, Arti Badhwar has been heavily influenced from the glamour and heritage that she’s been exposed to. From Bollywood’s own blue eyed boy, director, Mohit Suri (her cousin), to the seven generations of her family who were committed cotton and ginning mill owners spanning across undivided India, Arti has found her niche in design. Introducing ‘Aan By Arti’, east meets west. One important lesson Arti gained from business, is the importance of good fabric and a regional understanding of her culture, which is visible in her high fashion designs. Her trademark style is to combine traditional Indian design with western aesthetics. Much like the business name, Aan’s diaspora appeals to the global woman; strong and powerful, yet graceful and feminine. She is a woman who values art and elegance and would never compromise on finesse. Arti and her team pride themselves on providing excellent customer service. She has just recently launched a brand new eye-catching collection and her team is all set for another busy year. We recently had an opportunity to catch up with director of Aan By Arti, Ms Arti Badhwar, to discuss her journey into the world of Indian fashion design. Tell us about your journey. Who or what inspired you to create Aan? My family has been in the cotton and ginning milling business for seven generations and I’ve been told that it’s in my DNA. In all seriousness though, I found that there was definitely a gap in the market for handmade luxury products at reasonable prices and that’s what led me to start Aan By Arti. Your outfits are incredibly versatile – a beautiful blend of contemporary and traditional style aesthetics. Can you tell us a little about your designs? For this I would like to share some feedback from one of our customers right after we re-launched our brand. “Love your work. I trust in the knowledge that all your pieces are made with love. Always the right mix of sophistication, glamour and sass”. This sums up the philosophy of Aan. Do you have a favourite from the current season collection? It is very difficult for me to choose, as you can imagine. However, if I had to choose, it would be either the oxblood sari gown or the velvet gown in the same colour. Another one would have to be the black cocktail lehenga. Where do you draw inspiration or creativity from? As a designer, I don’t think that many people realize this but we are constantly thinking about our craft. My inspiration could come from anywhere for example; a recent visit to the Taj Mahal inspired some of my embroidery patterns. What do you believe are the current trends in bridal fashion and are there any tips you can offer future brides who are currently in the middle of their wedding shopping? 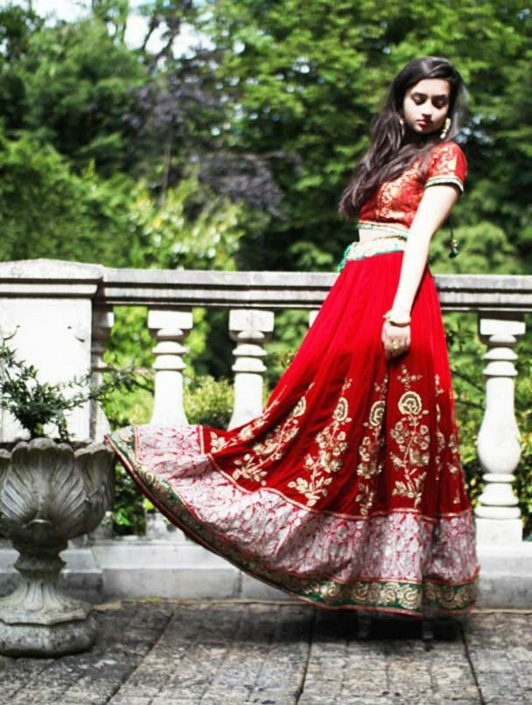 Without a doubt, the classic lehenga and gowns, for brides as well as bridesmaids. The saying goes that the only thing that is constant in life is change, but one thing that has remained constant for me, is that the bride will always look most beautiful in a lehenga. The ‘big fat Indian wedding’ has become more elaborate ove time and this has been reflected in the rise of the gown. We have been crafting wedding gowns for mostly the European market for the last 10 years. As you can probably tell, this season I am partial to oxblood colours. I believe strongly that for brides you can never go wrong with timeless red, pink and gold hues. What sort of services do Aan By Arti provide for future brides? For our customers we are very hands on and we style brides right from their wedding attire through to their footwear and even provide links to certified jewellers. We love to assist wherever we can and treat our customers like family. Aan specializes in hand embroidery. So, whether it is zardosi, gota, sequins, aari work or Swarovski, we offer made to measure couture and are open to input from the brides to enable us to create their dream wedding outfit. How do you source your fabrics? At Aan By Arti, we work with a range of traditional Indian fabrics and the remaining fabrics are imported from Hong Kong. Describe your own personal style philosophy. Be comfortable and confident in whatever you wear! Who are your personal favourite designers? Alexander McQueen, Eliie Saab and Rohit Bal. If people wish to get in touch with you, how can they do so? It takes 6-8 weeks per outfit depending on the work required. You may contact us via the numbers provided or email us directly at info@aanbyarti.com. We are open to appointments at our London studio or alternatively, if you are based in Delhi you can take a personal appointment with me in the city’s heart of the bridal centre, South Extension 2. If you have ever worn an Aan creation, we would love to hear from you! Share your comments below and don’t forget to subscribe here to stay up to date on all our future posts.